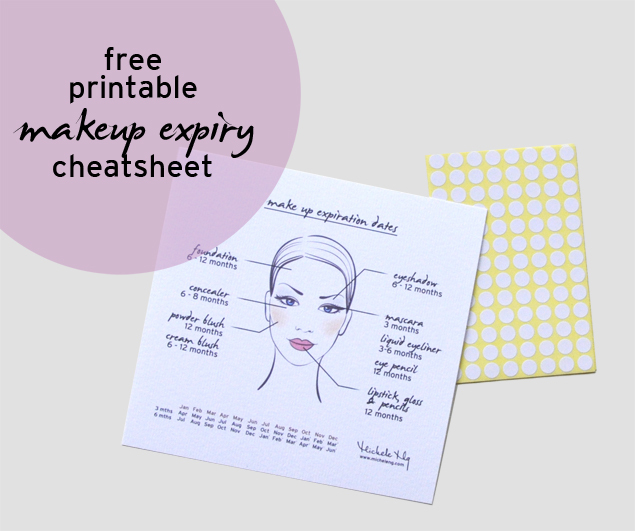 Download this cheat sheet and print it out. (You can size it down and cut it to size if you’d like. Thicker paper is also more durable!). 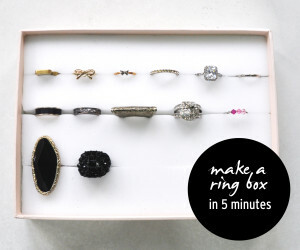 Get some small stickers and a pen handy for storage at your dresser. Some people suggest using permanent markers or sharpies to mark it down but I prefer my markings to be small, neat and visible on dark backgrounds – hence the choice of small dots. I’ve included general and commonly used expiration dates on my cheat sheet. It all depends on how you use it too. For example, cream blushes that squeeze out of a tube will likely to have less germs introduced than a pot of cream blush which you stick your fingers into everyday. Powders are dry and have a longer shelf life than makeup that is moist. If you’re paranoid, take the earlier expiry date. And that’s it! 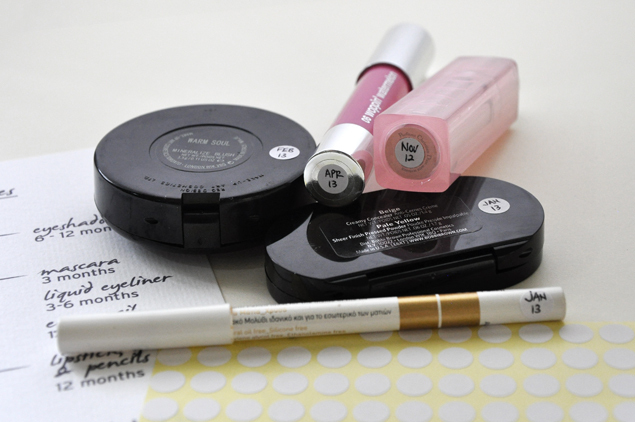 Go through your makeup now and toss whatever’s dubious. 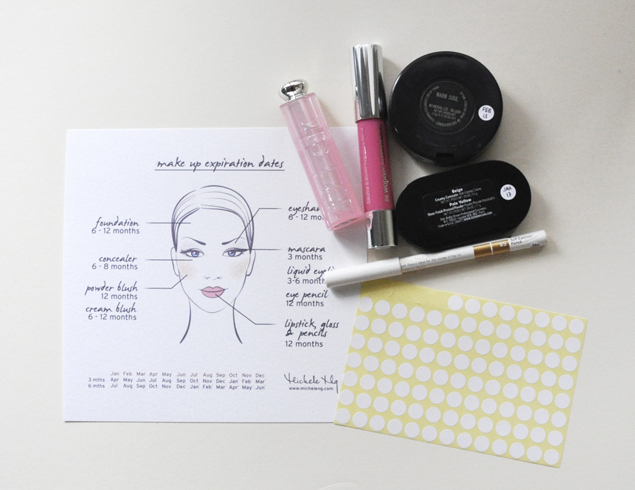 And each time you buy new cosmetics, take out the cheat sheet and sticky dots at your dresser and label away! 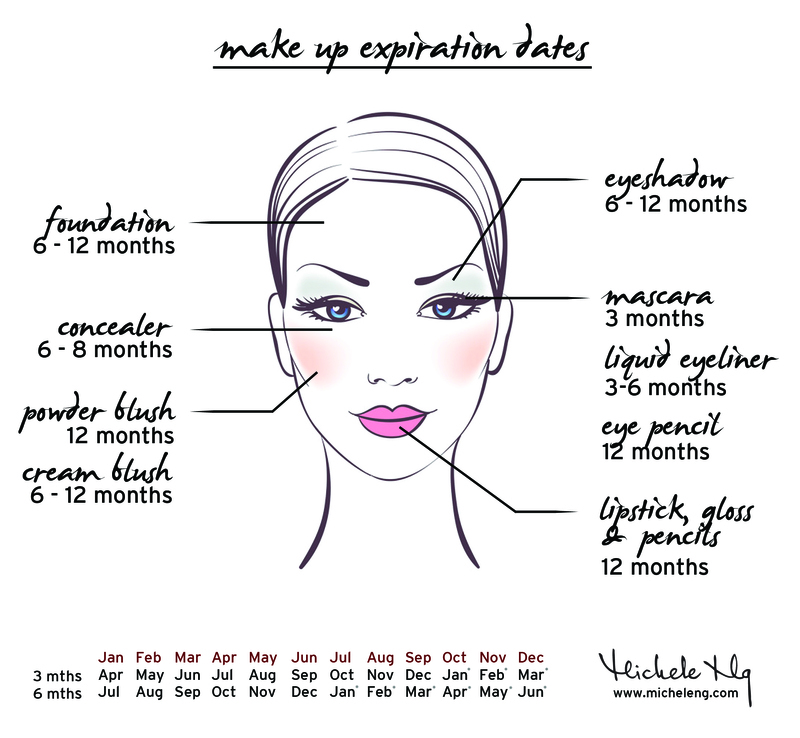 If you have more time on your hands and you don’t like the idea of handwritten dates on your makeup, you could color code the months and color each sticker differently so it looks better in general. p/s Things have been crazy due to a multiple day makeup gig recently – apologies for not posting till now! I have a whole backlog of ideas stuck in my head so stay tuned for more soon! Your idea is brilliant. I have a compromised immune system and really try to not use contaminated make up but didn’t have a formal system to keep track of when I bought products. I relied on my memory which is unreliable. Thanks for this post and system. Thank you so much for sharing your system! Been wanting something like this for myself (and my customers.) Is it okay with you if I print your cheat sheet and hand them out to my customers? Will be sharing your post on facebook and pinterest. 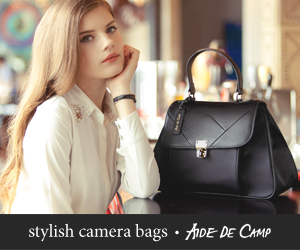 Love your camera bags BTW!